I had a dream the other night. Okay so I have dreams every night. Wonderful, wild, bizarre and beautiful dreams. But the other night I had one that seemed pertinent enough to write about here, so I invite you to follow me down this rabbit hole for a moment because there really is a point to it all. So I was here in Haiti, down at the Living Media center with a group of people, some Haitian, some American, and we heard a loud crash outside. I ran outside to see what had happened and noticed that a large tree had fallen, trapping an entire family of sloths underneath of it (no, there aren’t sloths in Haiti, that’s why it’s a dream). Overwhelmed by a burden to help the sloth victims, I hurried to the tree and was discovered a sense of superhuman strength which allowed me to heave the giant tree trunk off of the sloths. I threw it to the side to find a mother and a papa with four babies and one older grandma sloth all smiling up at me in appreciation. 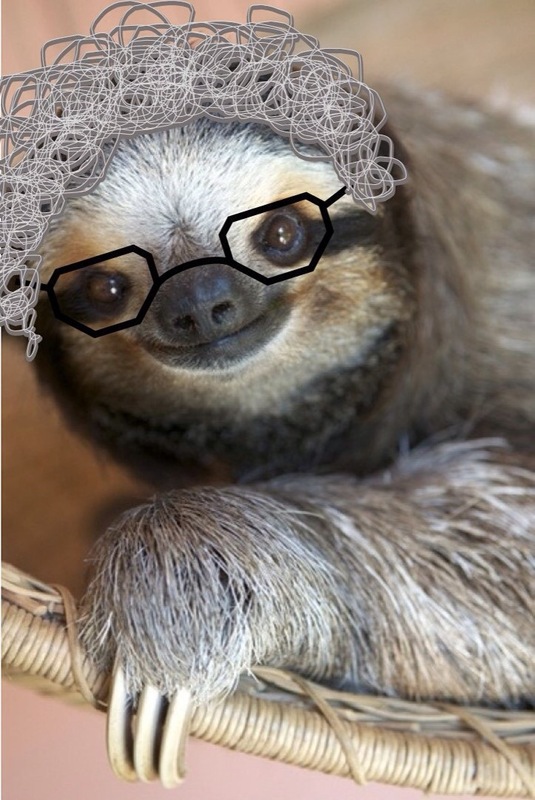 The grandma sloth had grey hair and granny glasses, yes, granny glasses, much like Sophia Patrillo’s. She was apparently quite near-sighted. She spoke to me with a frail but wise voice, thanking me for saving their lives and expressing that they wouldn’t have survived if it wasn’t for me. The others didn’t speak but just smiled gently while the little ones giggled and cuddled with one another. As the grandma spoke, one of the babies reached out slowly and grabbed my hand. I told them that I was happy to help and then carried them all to a different tree where they could all move on with their lives. Then I told them that I had to go because I had another activity that I had to get to but I was sure that I would see them again. They waved good-bye and I left, leaving the other humans there at the center while I hurried off to take care of some other responsibility, thinking very little of what just happened because that’s just what I do. If I see someone, or some sloth, that needs help and I have the ability to help them, I do so. And that’s that. No big deal. But then I got back from whatever it was that I was doing a couple of hours later and I found one of the Americans that was there still standing there at the center. All of the others had left but she was standing there waiting for me to get back. When I got there she said that she wanted to make a donation to Living Media and would be giving us $1,000. “That’s great!” I said, knowing how much that money could help us with our programs designed to realize our mission of helping young adults in creative educational opportunities. Then the donor told me that she was giving it to support research in the cross-breeding of sloths and beavers because maybe then sloths would be better equipped naturally to protect themselves from falling trees. And that’s where the dream fades, or at least my recollection of it does. So I don’t know how I responded to the donor’s offer in the dream, but I know how I would be tempted to respond if it was real life. I would have smiled and thanked her for her donation and her heart for the poor sloths, but also explained clearly that I couldn’t be sure how much we could do because we are not, after all, a wildlife protection organization, or even anything close to one. Then once her donation cleared our bank accounts, I would encorage our staff to use the money to serve the people that our programs were designed to help in Living Media and cover some of our unavoidable financial needs that we’re unable to find other donations for. I would advise the money be used for what our organization and our community have agreed are top priorities from the time that we started working, knowing that the donor was clearly out of touch with the reality of why an organization like ours exists and what it exists to do within a community such as ours. Knowing that pointing out how out of touch she is would only mean losing her as a donor and making myself come off as an egotistical jerk, I would choose rather to take a path of leaving the donor in the shadows of her good intentions while using my own experience and that of our staff to make better decisions of how to use that donation. I would feel a burden to remain accountable to my local community and hold their priorities above that of the donor even if that means not sharing the entire truth with the donor. Because I know that the local community would place the cross-breeding of sloths somewhere on the priority list way after education for their children, support for their young people, business opportunities for families, but somewhere before receiving TOMS shoes and fortified meal packets and one more VBS program. So I would make sure that those top priorities are addressed first, which means focusing on people, but I would keep the sloths in the back of my mind just in case down the road we are so successful at the other things and have so much extra money that maybe we can put one of them in a cage with a beaver and a box of dark chocolates with some romantic music and see what happens. But then a year later when that donor emails me asking for some photos of the sleavers or bealoths that we’ve bred and evaluations of their superior survival adaptations and financial reports of how it all happened, I would be screwed. I would have a clear conscious knowing that legally I didn’t do anything wrong because we never solicited any donations for sloth protection so we wouldn’t be obligated to use the funds for that purpose even if that’s what the donor requested. Legally, we would be first and foremost required to be accountable to the demographic that we were established to serve, which would be the young adults of Haiti, not the sloths in old trees, or the donors with money to give, and that original demographic would have a lot more important ways to benefit from that money than what the donor had requested. But I would still be stuck in a murky moral mire knowing that I had accepted the money based on the donors misconceptions and now I would be left to defend that decision and account for what we did with the money without alienating the donor or coming off as apathetic to the cause of the sloths. The fact is that I love sloths. It would be awesome to have one as a pet if that were an option. I also love donors. Couldn’t live without them. But what I love even more than both of them is undesignated donations that are given without any emotions attached to them. They are what allows an organization to most effectively achieve its mission, yet they are the least likely kind of donation to be given because we all like to think that we have complete control of our money to its absolute end. We all like to think that we always know what’s best to be done with our money. I suppose it’s easy for me to see things differently as someone who’s always worked hard to earn everyone else’s money but has never had much money of my own. That’s why, despite all of that hard work, even if I choose to use $5 out of that $1,000 to eat a sandwich for myself instead of one more brick to build the sleaver habitat, then I’m the one that gets criticized as corrupt. Yes, the sloth situation may have just been a dream, but the sad truth is that it represents all too often the reality that many, if not all, nonprofits have to continually deal with. Donors are the ones giving money that they’ve worked hard to earn, so they like to make all of the decisions of what that money should do. Meanwhile, the organizations have spent critical time and energy researching what their communities’ most urgent needs are and then they’ve invested resources in training local staff to address those needs according to their own specific abilities. And too often those two sides don’t match up. There’s a disconnect between what the donor thinks is best and what the community actually needs. And it always puzzles me why people think this is appropriate. We wouldn’t pay Nike to make us a laptop and we wouldn’t pay Ford to build us a house. And when you buy your groceries from Walmart or Whole Foods, when you hand over the payment to the cashier, you don’t leave a note for the CEO of that company of how they should spend your money. So why do we donate money to environmental organizations expecting them to send kids to school, or educational organizations expecting them to build churches, or arts organizations expecting them to feed people? Why do we donate money to an established organization with an established mission and clear methods of how to accomplish that mission and experienced boards and staffs in place to ensure that it gets carried out, but then we still try to tell them exactly how we want that money to be used? Once we pay for groceries at Walmart, we accept that that money is no longer ours, it belongs to Walmart. (Don’t send comments about how Walmart is evil, it’s simply the most universal example I can use.) But when we donate to an organization, why are we unwilling to accept that that money now belongs to that organization and trust them to do what they know is best? Yes, I have strange dreams every night but maybe my craziest dream of all is a dream of an organization that is truly empowered and supported 100% to do what it was created to do. A dream where poor local activists and foreign wealthy donors can sit down together at the table of brotherhood without compromising their visions. I have a dream.